We’d love your help. Let us know what’s wrong with this preview of The Torch and the Sword by Rick Joyner. To ask other readers questions about The Torch and the Sword, please sign up. Oh how I want to walk in the heavenly realm and know what is going on like Rick Joyner did in his vision. This book is so good and helps me keep my eternal mindset. Nothing else matters but Jesus and seeing His kingdom come! I have read this book at least 3 times and I feel like I've only begun. One of my best reads ever! It picks up from where 'The Final Quest' and 'The Call' left off by the same author. This book is not infallible (only the Bible is) but it is utterly Biblical. It is relevant for growth in intimacy with God, teaching, counseling in ministry, etc. The trilogy is to me, one of the most profound prophetic revelations received in our times. This is the last book in The Final Quest series. It portrays the seriousness of the spiritual battle we are in. We are reminded of the importance of the torch and sword that the Lord has given us and to use them wisely. This is the final book in the trilogy. It is quite different. The first two books were about a prophetic experience of maturing in Christ. This book is more of a vision of the future. The revelations are unexpected. Women play a huge role in the events of this book. It presents a complete paradigm shift from the way we view God's Kingdom. Challenging to read. Potentially the most important book I've ever read. I'm going to have to read and re-read this book for years. Everything in this vision rings true with what I see God doing right now. This book should be required reading for every Christian leader. If you are on a journey to serve the Lord, this is a must read book about a prophetic message given to those who would be warriors. Compelling. The Torch and the Sword is a must read for those wanting to walk in deep intimacy with the Lord. 4. I must use my authority but carefully and under obedience. This book outline the spiritual battle we are currently in, the weapons, strategy and future for those that are willing to humbly self, walk in love, courage and unity. Working in concert with the rest of Christ body as one. There were some nuggets in here that were really good, but it wasn't quite as amazing as the first on in the series. Recommended to Zuri by: Nadie. El mundo de los sueños es considerado por muchos como el hogar de la fantasìa, el misterio, y a veces, el sitio de nuestra mente en donde la verdad parece estar prisionera. Ademàs, no son pocas las veces que muchas personas buscan en ellos respuestas importantes, asì como tambièn, la revelaciòn del futuro, el cual, por cierto, puede ser halagador..... o terrible. Justamente es eso lo que Rick Joyner nos describe en su obra "La antorcha y la espada". Cargada de elementos de la Nueva Era, esotèricos El mundo de los sueños es considerado por muchos como el hogar de la fantasìa, el misterio, y a veces, el sitio de nuestra mente en donde la verdad parece estar prisionera. Justamente es eso lo que Rick Joyner nos describe en su obra "La antorcha y la espada". Cargada de elementos de la Nueva Era, esotèricos, y ocultistas, este libro nos relata las visiones profèticas que tuvo a partir del año 1988, y que continuaron hasta el 2002, en los cuales se vaticinaba una inminente batalla entre el bien y el mal, y còmo los guerreros del ejèrcito de Dios habrìan de prepararse. Escrito en primera persona, Joyner nos habla de encuentros onìricos con numerosos personajes, aparentemente enviados a èl por un Poder Superior para adoctrinarlo en vistas de la rebeliòn que se aproxima, y a la cual, toda la humanidad habrà de enfrentar. El autor, quièn tambièn es pastor, director y fundador de la iglesia Morning Star Fellowship, refuerza su trabajo con pasajes bìblicos, quizà para tratar de incrustarle algo de importante credibilidad. Si bien es cierto que la narrativa es directa y de tèrminos simples, su lectura puede resultar algo nebulosa, pues los elementos que ha en este "mensaje" literario, pueden acabar siendo un conjunto de simbolismos que un catòlico podrìa entender bien, pero no el resto de las personas, por lo cual, es fàcil que algùn lector se pierda en la trama. Dudo que Joyner lo escribiera sòlo para los fieles de su congregaciòn, puesto que hace menciòn de que todos habràn de prepararse para la batalla. No obstante, si se quiere entretener con este tìtulo, tal vèz habrìa que despojarse de cualquier idea religiosa preconcebida, y asì darle oportunidad. De lo contrario, leerlo serìa intolerable, puesto que los conceptos que tengamos en estos temas chocarìan constantemente, e impedirìan un avance còmodo en la historia. En lo particular, siento que las batallas màs importantes, son las que se libran dìa a dìa para enfrentar la vida diaria. No creo que alguien pueda ganar una batalla quedàndose dormido. Hay que tener los ojos bien abiertos para plantarle cara a las adversidades, y reconocer cualquier oportunidad que nos lleve a triunfar. En fin, ya se hizo noche; debo descansar. Irè a dormir para recargar energìas. Ojalà no tenga que enfrentar alguna guerra cuando cierre los ojos. 1. There is a River of God’s Presence that gets bigger the more we drink from it. Also, the larger the number of people is drinking from it, the bigger it gets. We have to guard it from getting polluted. 2. A young girl mentors a more mature and higher ranked person in how to ride his spiritual horse and drink from the River of God’s Presence in order to see more clearly and get directions. She also is very instrumental in helping to organize and utilize people’s giftings so that the army can fight more efficiently. 3. Even though the enemy might be surrounding you in overwhelming numbers, victory can be immanent. 4. People from our great cloud of witnesses show up to help us in the battle sometimes. 5. Our (human) enemies can be turned into friends by giving them a drink from The River of God’s Presence. 6. Never cut down something evil with your sword that you don’t plan on replacing with God’s Torch of LIGHT or it will grow back so huge that its fruit could crush houses and poison hundreds! 7. Prophets look like eagles in the spirit. When they flap their “wings” by rising up into The LORD’S Presence, they not only see how to move forward, but the Breath of God rolls away the poisons of carnal air and makes it easier for the whole army to see better. There are many other wonderful lessons in this book that have changed my life: lessons that I have used over and over in my walk with The LORD Jesus. I read it over every so often and see things in it that I had overlooked before. It is one of those books that even though I give them as gifts, I always keep a copy in my own personal library. Over the years as I mature, I get new and more wonderful lessons from it. I highly recommend this book! it's hard to review this book. I really enjoyed it and read through it very quickly (probably helped that it's such a short read too), yet at the same time, I'd only read a chapter or so at a time and need to stop and digest what I'd read. there's a lot of food for thought in it. it's always interesting to read someone else's visions; I spent a lot of time comparing what Joyner wrote to what is in Scripture. I didn't find anything that was problematic for me. in fact, some of what he wrote, abou it's hard to review this book. I really enjoyed it and read through it very quickly (probably helped that it's such a short read too), yet at the same time, I'd only read a chapter or so at a time and need to stop and digest what I'd read. there's a lot of food for thought in it. it's always interesting to read someone else's visions; I spent a lot of time comparing what Joyner wrote to what is in Scripture. I didn't find anything that was problematic for me. in fact, some of what he wrote, about nature/ the environment, women and their role in the church, and a few other subjects was actually different than what I've heard in many churches, but in a good way. He said some things I've believed/felt for a long time, but didn't know how to articulate in a logical way. This book is a call to action! This book is to be lived out not just read! This book is fast forward in seeking God's heart having eyes to see and ears to hear as Holy Ghost leads. Love those who hurt you, give Living Water to your enemies and watch the ravenous wolves drink deep of this Living Water. I drink deep of this Living Water, I bow before my King Jesus letting His love His Blood wash over me. I once was lost but now I This book is a call to action! Love those who hurt you, give Living Water to your enemies and watch the ravenous wolves drink deep of this Living Water. I drink deep of this Living Water, I bow before my King Jesus letting His love His Blood wash over me. I once was lost but now I am found, I once was blind but now I see, It's Jesus blood that cover me, It's Jesus love that carries me. I love my Lord Jesus I feed His sheep of whom I am now one. Awesome book. It revealed to me the power of God in my life ! I gained knowledge to handle the current problem in my life which is my job.......to be the torchbearer no matter what ! God will redeem me. This is the third book in a series of prophetic revelations. A real easy read and very insightful. I highly recommend all the books in this series. It puts a lot of things in perspective and stirs a hunger for Jesus. 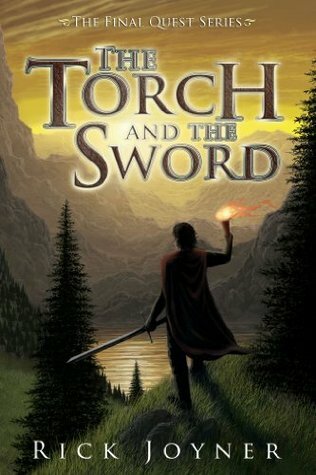 This series of books is life changing - The Final Quest, The Call, and The Torch and the Sword. They show where the Church is now and what needs to change. I've read all of them several years ago, but felt led to reread them now - they are amazingly accurate to where the church is today. All Rick's books are must reads. Insight into the coming war of the worlds.great book. I really feel this book is lesser known only because The Final Quest was so powerful. This was an excellent book, with many deep truths that have impacted me. I try to get a wide variety of perspectives, and Rick Joyner offers me the prophetic and allegorical side. I have read many Rick Joyner books. Not disappointed to have read another one. one summer I read all three books back-to-back-to-back. the whole series will mess with your theology if you happen to be coming from a Traditional Church background. This is the other book in the series by Rick Joyner that I read. It's about a dream that he had from the Lord. It's intense, but well worth reading. Very enlightening to the spiritual battle of the times!